« What landscapers do when they aren’t plowing? Be Thankful for the Little Things… Snow Cover is a Good! I’ve been thinking lately about the frigid temperatures that we are enduring this winter. That crunchy, grinding noise the snow makes when you walk in it lasts all day. This used to be something that was enjoyed only in the predawn hours. The good snow cover that we have is VERY beneficial to our plants! 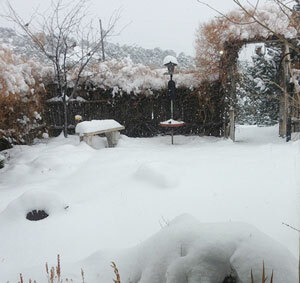 Snow is a great insulator of the soil, keeping temperatures higher underground. Snow cover can protect plant roots from cold related damage. Snow cover protects plant foliage from wind burn. So even though you may grumble about the snow now, your spring flowering bulbs, perennials and woody ornamentals will thank you later. Check out my interview, The Importance of Proper Landscape Maintenance on Michigan Homes, one of the top sites for Michigan homes for sale, including Macomb, MI real estate. Michigan Homes also services Illinois homes for sale and Pennsylvania homes for sale. Who’s up for a snowball fight? GRAND RAPIDS MI ARBOR DAY TODAY AND EVERY DAY!